■ To install the standardized springs, please use the height adjustable parts (sold separately), or with TEIN's height adjustable shock absorber kit. Please refer to each pages for details. ■ All of TEIN's standardized springs are ground on both ends. ■ We use SWOSC-KV silicon chrome metal (JIS standard) to pursue the maximum quality of high tension and endurance for all standardized springs. ■ Stable quality, endurance, and high performance is maintained by special procedure (cooling formation). ■ The straight type springs are measured by inner diameter. and, specified spring seat is required. The outer diameter changes with alignment. ■ These springs are tapered and the bottom diameter is I.D.70mm, with two types of top diameters of I.D.90mm, I.D.100mm. These are standardized springs which have been developed to adopt with original upper mounts for original double wishbone and multi - link suspension system. Tapered Type Springs have the following outstanding characteristics. ■ Ideal for N1 and other vehicles whose upper mounts cannot be replaced under regulations. ■ By eliminating the upper spring seat, we have achieved low cost and adequate bump stroke. ■ It eliminates the damage to upper mount and other noise by maintaining same force input positions as original products. ■ As it is tapered, spring stroke can be maintained better than the straight type with same spring coefficient and length. ■ By setting 2 springs in a series, variable spring rate can be achieved. ■ It gives unlimited setting range with wide winding point weight set ups. 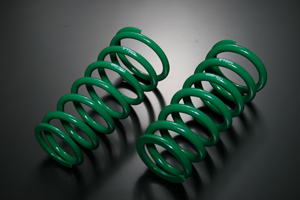 ■ The A spring is a series twin spring, and the B spring can be selected from straight type with I.D.70mm or tapered type springs. A variable spring is achieved through changing over from original spring rate to B spring rate. ■ The spacer spring seat is necessary for installation with the A spring. 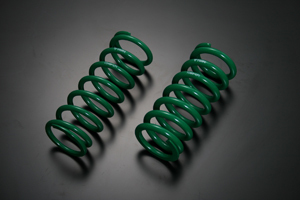 Springs most suitable for rally and off-road uses are available. Please refer to TYPE Gr.N ( F.R.S. Spec / Standard Spec ) pages for more information. We can produce made-to-order springs to the desired shape, size and/or rate. Click here for details. **Discontinued and only available while supplies last. Drop us a line, ask us any questions!